Hi, we are a family of 3 adults, 1 elderly, 2 children visiting Hong Kong Disneyland in late December. Can you advise what would be the best way to go to L'hotel Nina Et Convention Center in Tsuen Wan. Train or Cab? I would like to know if I come from macau,how to get to l'nina hotel tseung wan from ferry terminal? is there any bus transport or should i take mtr? We will be arriving in Hongkong at around 7:55 am and we are planning to check in to our hotel which is l'nina before proceeding to Ngong Ping. Can you give us direction from our Hotel to Ngong Ping, We would like to take the MTR if it is not too difficult. Day 1 arriving in HK @ 1:50a.m. 1:00a.m. flight to the Phils. also, would you know how much would a taxi cost from Victoria's peak to the airport? or is there an MTR going to the airport? thank you again!! Victoria Peak is 17.8 kilometers far from your hotel and it's a 24-minute drive. thanks so much for your kind reply! its really a big help to me since i do all the preparations..how far is Victoria's peak from our hotel? and would you know what time it closes? thanks again! Hi! thanks for your reply..but I forgot to aks how can we get to L Nina hotel from the airport? we will be arriving in HKIA @ 1:50 a.m. would there still be transportation (MRT or bus) available at that time? or we have no choice but to take the taxi? if we take the taxi, what taxi color should we take..thank you! *Head from the hotel and only 5 minutes is needed to reach West Rail Tsuen Wan West Station, you can take MTR to all major parts of Hong Kong. Along the walking path, you can walk pass Tsuen Wan Park. With such a near MTR station, you can grab a great chance to have a closer look of Hong Kong. Getting to HK Disneyland from your hotel: Get into the MTR trains and take the Tsuen Wan West Line and get off at Mei Foo station. Interchange trains to Tsuen Wan Lines and get off at Lai King station. Interchange trains to Tung Chung Lines towards Tung Chung station and get off at Sunny Bay station. 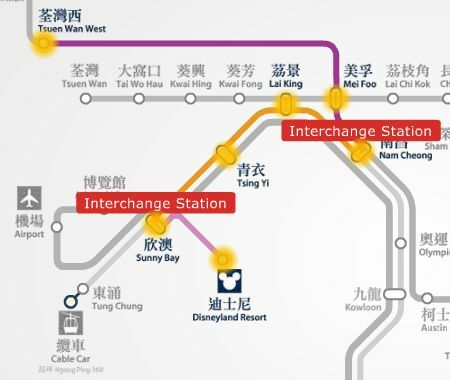 Interchange trains to Disneyland Resort Line (35 minutes @ HK$18.1). A sweater is fine for this time of the year by the way. Have a wonderful trip to HK! Hi! it's me again..from La nina hotel, what ride shall we take going to the turbo jet heading for Macau?thanks again! how to go to HK Disneyland fron L nina hotel? Hi! we will be staying at La nina hotel on our trip to Hong Kong this march..what ride shall we take in going there? and also, what would be the weather there by this month? thanks! There is NO problem if you're bringing along with big luggage when taking the MTR trains. The only thing you should worry about is the manpower to carry those luggage would be enough considering you'll come along with an elderly and children. Also, if you take a taxi it would be more comfortable but should be quite expensive and I'm not sure if all of you can be accommodated in one taxi because of your luggage otherwise you'll need two taxi. Thanks for your prompt reply. L' Hotel Nina Et is my next destination from a 2 day stay in Hollywood Disneyland Hotel. We have about 4 mid to large size luggage, 3 adult, 1 elderly, 2 young children. Would taking taxi be easier or taking MTR be easier. Can MTR accommodate standard luggages size? Please advise me if you can. Thanks. I assume that you'll be heading to Disneyland directly but I would suggest that you check-in your luggage first at the hotel before going to Disneyland as bringing your things to the resort is quite inconvenient. Anyway, if you're coming HKIA and want to go directly to HK Disneyland, click here for a detailed information on how to get there. Try to negotiate a taxi if you can be accommodated in a single cab and if not, then I strongly suggest you take the MTR trains which is the most efficient way of transport in Hong Kong. L'hotel Nina Et Convention Centre Hong Kong is a 5-star hotel situated at No. 8 Yeung Uk Road, Tsuen Wan, HK. Take the Disneyland Resort line MTR trains at Disneyland Resort station (very close from the resort entrance) to Sunny Bay station. Interchange trains to Tung Chung line towards Hong Kong station and get off at Nam Cheong station. Finally, interchange trains to the West Rail Line trains and get of at Tsuen Wan West MTR station and take exit E. Follow directions to your hotel for about 5 minutes walk.